Printing was first introduced to Sri Lanka through the Port of Galle during the period of the Dutch colonization. With the development of the printing industry worldwide, Sri Lanka is one of the few countries that adopted the latest technologies very early. Leading Sri Lankan printers are well equipped with multi-color printing machines spanning several popular brands with finishing equipment.In the recent past, the Sri Lankan printing industry invested in technology which led to expansion of capacity and vast improvement in quality. 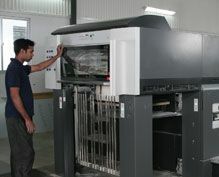 Sri Lankan printers are now in a position to undertake any type of small and medium-sized printing activities. At an age where several forms of paperless channels are being utilized to carry communication, this creates the opportunity for printers to handle even smaller quantities at economical prices. Commercial printing supports major export sectors, with quality offset printing of packaging materials, especially tea cartons and garment tags and labels, of which almost 90% is exported. Other prominent areas of printing exports are printed stationery, NCR (Non Carbon Required) items, diaries, greeting cards and magazines, fostered by a high level of design and creativity in the Sri Lankan business sphere.. The Sri Lankan stationery products industry has today reached international standards keeping up with the latest trends. Sri Lankan manufacturers have proactively expanded their range of products to include a variety of novel, environmentally friendly items. Printing primarily caters to export markets such as Singapore, India, UAE, UK, Germany, Venezuela, and Maldives. At present, there are about 4,000 printing establishments providing job opportunities to over 40,000 people. There are three printing schools in Sri Lanka, namely, Sri Lanka Institute of Printing, National Apprentice & Industrial Training Authority (NAITA), Institute of Printing and Graphics Sri Lanka Limited (INGRIN) at which many school-leavers is being trained. Sri Lanka produces good young printers with the local printing schools. This creates a greater opportunity to do outsourced printing from Europe and rest of the world in Sri Lanka. Support services to the printing industry begin with typesetting, designing and page make up services to plate making and plate setting. In the case of book printing, the service ends with print finishing and binding (either perfect bound or case bound). High-speed perfect binders, three knife trimmers and case binding are now available in Sri Lanka. The printing of packaging materials are handled with modern technologies. As a result, Sri Lankan printers are now in a position to undertake any type of printing services for total packaging (tags, labels, cartons, sacks, sachets).